Celebrate “Thanksliving” Fruits & Roots Style! Don’t worry; we have your back! Relax and let Fruits & Roots prepare your “Thanksliving” feast this year. 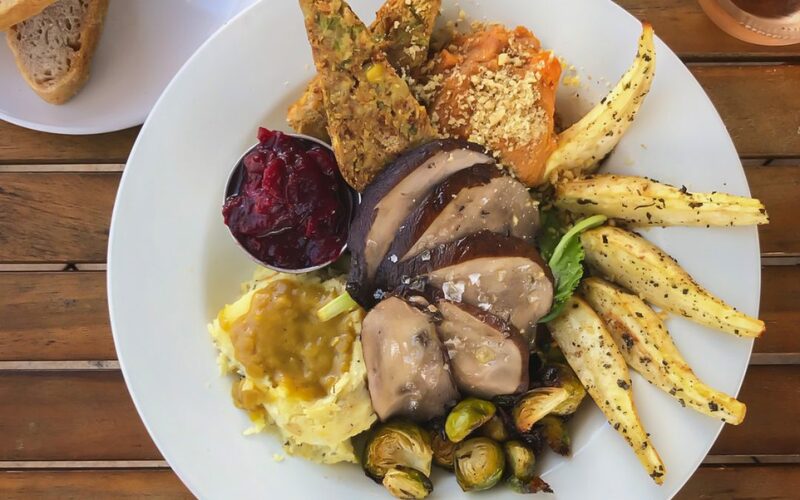 Our special vegan Thanksliving entrée includes thinly sliced Portobello mushrooms on a bed of greens, roasted Brussel sprouts, classic stuffing, cranberry sauce, creamy mashed potatoes with mushroom gravy, rosemary roasted parsnips, and sweet potato mash with walnuts alongside our house-made sourdough bread and vegan butter. And for dessert, how about one of our famous homemade cheesecakes: coffee chocolate topped with crushed nuts and cacao nibs or New York style topped with fresh berries?! Pre-order by Tuesday, 11/20 and pick up on Wednesday 11/21. Call 772-678-6627 and celebrate Thanksliving Fruits & Roots style! You are the change! 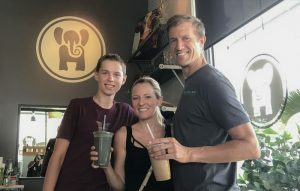 Thank you for being vegan or for trying more plant-based options. Whether you choose our Thanksliving feast, or you choose to cook your own, you are setting a healthy and compassionate example. Individual turkeys have unique voices. This is how turkeys recognize each other. Turkeys are intelligent and sensitive animals that are highly social. They create lasting social bonds with each other and are very affectionate; rather similar to dogs. And the best for last! Turkeys love hugs… Please watch this video until the end and SPREAD THE LOVE! Getting some quality family time in today. It was nice and quiet too, until Mr. Jealous Pants arrived.